Fiction – paperback; Faber and Faber; 624 pages; 2012. 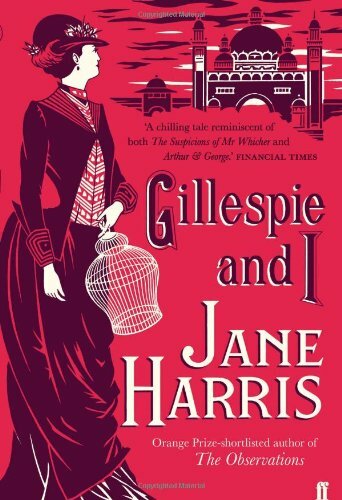 One newspaper review described Jane Harris‘s Gillespie and I as “literary crack cocaine” — to which I can only concur. I can’t remember the last time I had so much fun reading a novel. It transports you into a strange world of art, deception, troubled families, disturbed children, grumpy housemaids and caged greenfinches, and then takes you on a rollicking good ride that you don’t want to end. At more than 600 pages, this book — Harris’s second novel — kept me entertained for a fortnight. I had been reading it for so long, toting it around on public transport, reading it in bed and on lunch breaks, that I felt bereft when I came to the last page. The tale is narrated by Harriet Baxter, a woman of independent means, who wants to set the record straight about her earlier life in Glasgow in 1888. During this time she befriended a struggling artist called Ned Gillespie and became an almost permanent fixture in his family’s household — until something went very wrong with their relationship. She interleaves this account with her current situation — it is now 1933, she is rather elderly and living in a mansion block in Bloomsbury, London, with two little greenfinches for company — in which she begins to have doubts that her assistant, Sarah, is as trustworthy as she makes out. From certain angles, she might have been considered a great beauty. The neck was graceful; the features fine. Her eyes were deep blue, almost violet. But there was a hard quality in her face — and something in the breadth and tilt of her jaw — that (unfortunately) put one in mind of a frying pan. There are lots more little snipes like this throughout the novel, which is one reason why it is such a joy to read. But it also makes it slightly hard to reconcile the public image of Harriet — a Good Samaritan who helps people whenever she can — with the woman who confides so much to us. As one character says towards the end of the book, “I’m not sure what to think any more. I don’t know what to think about anything or anyone, including Harriet Baxter”. The book takes the best elements of Victorian fiction — idealised portraits of difficult lives, morality, inherent evil and undertones of a sexual nature — and gives it a fresh slant by throwing in some mystery and a courtroom drama. It’s also hugely evocative of Glasgow in 1888 — Harris has clearly done her homework about the International Exhibition that was held there at the time — but less so of London circa 1933. It’s all wonderfully paced — and plotted — too, so that you never become bored despite the novel’s length. And the overall atmosphere, while quite cheerful on the surface, is actually quite disturbing and chilling underneath. It’s a brilliant, brilliant read. Gillespie and I has been nominated for this year’s Orange Prize. It deserves to win it. I’m so glad you loved this. I have it to read and am longing to find a space in my schedule for it (finding a fortnight may be problematic!). But still, soon, soon….. I loved this one too! I’m pulling for it to make the shortlist for sure. I still have ten more to read from the longlist, but I wouldn’t mind if it won either. Oh – sounds so good! I can’t wait until my copy comes from the library! Your review makes me want to read this one right away. Nice to have such a strong recommendation for a winner too. Just bought this – glad you enjoyed it! Looks like I will too. Wow! What a review…that sounds like a fantastic book. I dread the 600 pages but you sound so very thrilled with this book, I’m going to reserve it at my local library. I completely agree with you about this book – I loved it! If you haven’t already done so, you should put her first book, The Observations on your wish list. It is just as good and was the reason I bought Gillespie & I as soon as it came out in hardback. I’m very keen to read The Observations now… I’d had no previous interest (for some reason) before, so nice to hear you recommend it. I am listening to this in audio right now and loving every minute of it – the feisty snipery (?) is so engaging. I’ve heard lots of good things about this – maybe I’ll break my anti-long-book rule? I’m glad you love it. I got it from the library today, hope to read it soon, at least I know reading the 500 pages hardback will be worth it! Thanks for the review. You don’t like the cover? I *love* this cover — so much better than the one for the hardback. I’ve heard so many good things about this book – I can’t wait to read it. And I’m so happy to learn it’s available on audio! Hooray! I am thrilled to see that you loved this. It was undoubtedly one of my very favourite reads of 2011, and one that I know I will come back to time and time again in the future. Drats I pressed send when I hadn’t finished… I was wondering if you had read Jane’s debut novel The Observations? If you haven’t you must, you would love the narrator Bessy, she is hilarious. I’ve just finished this book and absolutely loved it. I also came across the review that called it ‘literary crack cocaine’ and I have to agree. couldn’t put it down! I also read and enjoyed ‘The Observations’ – I think you would enjoy this too. I really want to read The Observations now. Next time I go to the library I’ll check if they have it available for loan (it wasn’t there on Saturday). Loved it thanks for the excellent review that prompted me to search it out at the library. So pleased to hear you hunted this one out and enjoyed it. If you haven’t read Harris’ earlier novel, The Observations, can I recommend you try that one, too? It’s just as good as this one.